Twenty nine gubernatorial candidates out of fifty-four seeking election into the Kano state government house, and the leaders of their respective political parties have resolved to ensure a peaceful conduct of the forthcoming general elections in the state. 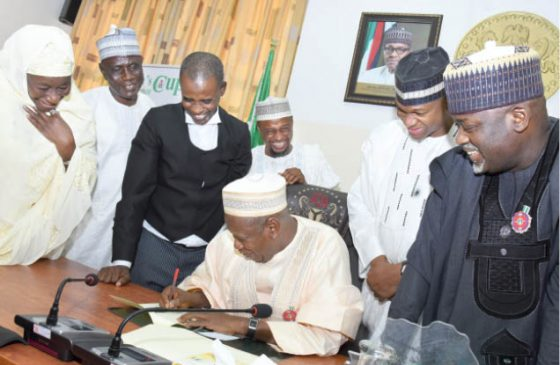 Among the candidates who signed the Peace Accord yesterday were the incumbent governor, Dr Abdullahi Umar Ganduje of the All Progressives Congress (APC) and Engr. Abba K. Yusuf of the Peoples Democratic Party, (PDP). There are believes that signing of the document would go a long way in bringing sanity into the Polity and among the key political actors and their supporters in the state. The peace document was signed at the instance of the Kano state peace committee, co-chaired by Professor Emeritus Ibrahim H. Umar and the Catholic Bishop of Kano Diocese, Rt. Rev. Dr John Namaza Niyiring. Speaking at the signing of the document, the Emir of Kano, Muhammadu Sanusi II warned the politicians against any act that can lead to destruction of lives and properties before, during and after the elections. Emphasising the need for all candidates to live by the tenets of the peace document, Sanusi urged the candidates to demilitarise their supporters especially during political rallies, saying without peace there would be no elections. “Peace is needed before the elections, it is important during the elections and we need peace even after the elections. “God has forbidden any act that is capable of tampering with human life or his property. Therefore, anyone who shed blood, or on whose account blood was shed, or who allows bloodshed for his personal interest even if he/she is not prosecuted on earth the final judgment awaits him in the hereafter. “I am calling on all political actors who have signed the Peace Accord and even those who are not here to start by instructing their supporters to lay down arms, and stop attending political events with weapons. The special representative of the United Nations Secretary General for West Africa and the Sahel, Dr Mohammed Bin Chambas commended the candidates for their resolve for peaceful elections saying the UN would continue to amplify calls by the National Peace Committee for all stakeholders to ensure that issue based political campaigns are conducted across the country. Chambers expressed concern over fewer women and youth candidates fielded by political parties despite the large number of women voters and enthusiastic youths eager to take part in nation building. Four female candidates, including Fatima Isa (RP), Hajiya Furera Ahmad (FE), Maimuna Ahmad (UPP) and Halima A. Ahmad (AD) signed the peace accord. The event was witnessed by the Chairman, National Peace Committee, Gen. Abdulsalami abubakar.